In the first terrorist murder on the British mainland since the 7/7 suicide bombings of 2005, the men attempted to behead the soldier, hacking at him like a “piece of meat” in front of dozens of witnesses, before both were shot by police who took around 20 minutes to arrive. 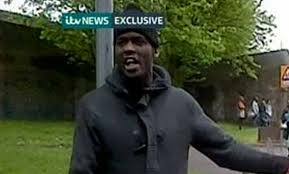 Speaking with a London accent, holding a knife and a meat cleaver and with his hands dripping with blood, he said: “We swear by almighty Allah we will never stop fighting you until you leave us alone. Your people will never be safe. The only reason we have done this is because Muslims are dying by British soldiers every day. “We must fight them as they fight us. An eye for an eye and a tooth for a tooth. I apologise that women had to witness this today but in our lands our women have to see the same. You people will never be safe. Remove your government, they don’t care about you. Do you think David Cameron is going to get caught in the street when we start busting our guns? Do you think your politicians are going to die? Witnesses said that the men used a car to run over the soldier just yards from the Royal Artillery Barracks in Woolwich, south-east London, before setting about him with knives and a meat cleaver as if they were “trying to remove organs”. One unconfirmed report suggested that he had been beheaded. Passers-by said they thought at first that the attackers were trying to help the man, who was wearing a Help for Heroes T-shirt, and only realised they were killing him when they got closer. Their victim, thought to be aged around 20, had reportedly been on duty at an Army recruitment office in central London and was on his way back to the barracks when he was murdered at 2.20pm. It emerged that passers-by went to the soldier’s aid. One of the killers ordered that only women could tend to the body, not men. When police did arrive, both gunmen tried to rush at the police and were shot, reportedly by a female officer. After the killing, one of the men, believed to be a British-born Muslim convert, spoke calmly into a witness’s video phone.